After the spectacular race in Val di Sole event last week, the UCI DH World Cup is already back on track with another highly anticipated round in Vallnord, Andorra. The track is extremely challenging, steep and bumpy. It’s notorious yet welcomed by many of the best athletes. 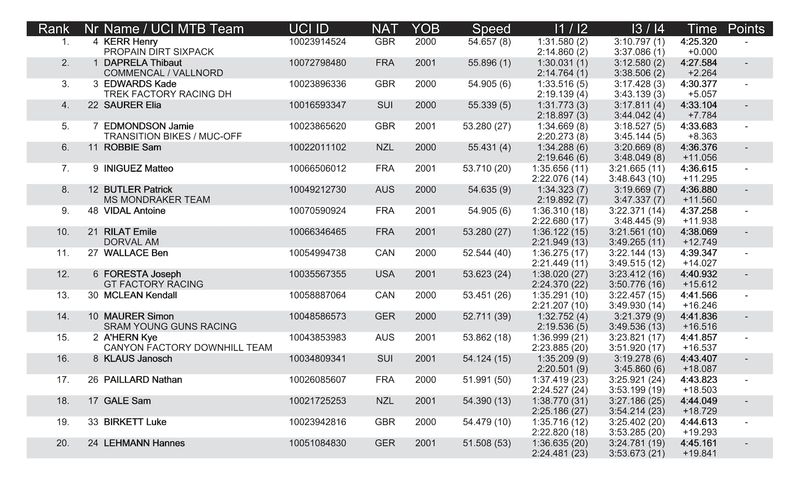 Today’s qualifier, with very mixed results sees 27.5″ and 29″ wheels alternating on the podium as in the last races. This continues to confirm that there is no wheel format that stands out over the other for absolute performance, and that for the most part results depend on the athletes piloting the bikes, and how much their personal size and riding style benefits from one size, rather than the other. 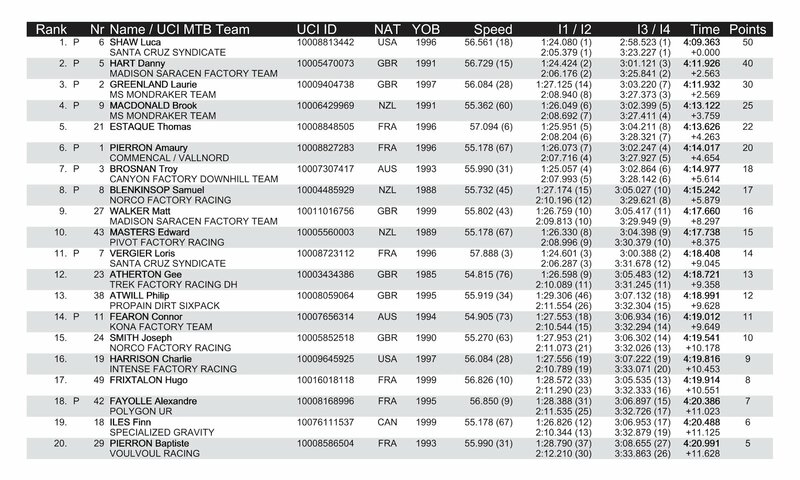 First place in the qualifying heat was claimed by Luca Shaw who bested Danny Hart by more than two and a half seconds, who is proving to be less aggressive but certainly more consistent than in the past. Third place went to Laurie Greenland, another young athlete who is showing speed and consistency in his results since last season, with a crescendo that will soon lead him to the top step of the podium. Brook MacDonald came out swinging in 4th, followed in fifth, by Thomas Estaque. Pierron landed in sixth place and everyone is already wondering if he will manage to make the difficult and historic task of winning four races in a row right in the home of his title sponsor, Commençal. 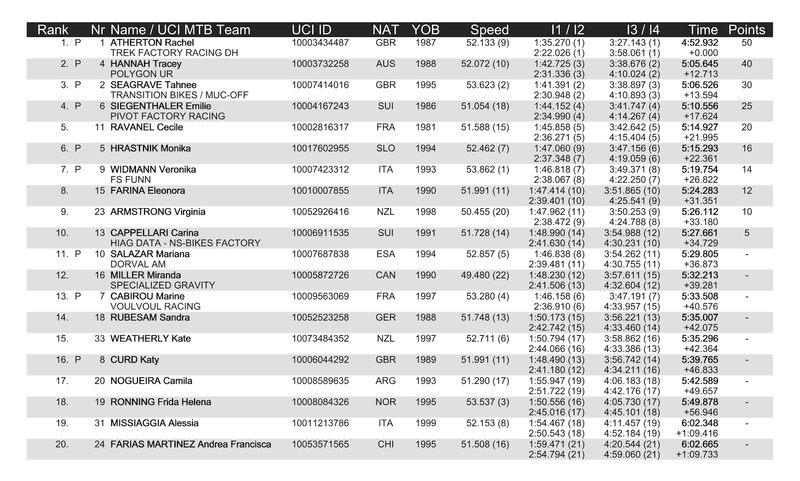 Rachel Atherton dominated the women’s qualifier, with a lead of over 12 seconds on Tracey Hannah. Third position went to Val di Sole winner, Tahnée Seagrave, followed in fourth place by Emilie Siegenthaler. In fifth position we find Cecile Ravanel who has the task of bringing the colors of Commençal to the top also in the women’s field, given the absence due to injury by Myriam Nicole. In the men’s Junior category Henry Kerr took first place by more than 2 seconds over Thibaut Daprela. In third position was Kade Edwards who rallied after a huge crash in practice yesterday. Valentina Höll continues to demolish her competitors in the Junior Women’s category, putting twenty-three seconds between her and the first of the pursuers. She posted a time that would have earned her a seventh place among the Elite women.